The Memorial Candle Program has been designed to help offset the costs associated with the hosting this Tribute Website in perpetuity. Through the lighting of a memorial candle, your thoughtful gesture will be recorded in the Book of Memories and the proceeds will go directly towards helping ensure that the family and friends of Ned Wade can continue to memorialize, re-visit, interact with each other and enhance this tribute for future generations. Ned Wade, 95, of Greeley, passed away peacefully on August 28, 2018, at his home. 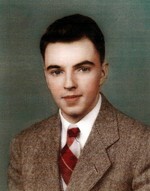 Ned was born in Wayne, Nebraska to Glea & Laura (Conover) Wade on April 21, 1923. Ned was a Machinist at Pratt Whitney during WWII then returned home to marry the love of his life, Eunice (Larson) Wade on November 22, 1950. He was the office manager for REA for the majority of his career with a few years at CF&I. Ned was a wonderful man who loved to travel, ride motor cycles, listen to Jazz music, explore new technology, craft and wood work with his wife. Above all, Ned was a devoted husband, father, and grandfather. His kindness to animals, large & small, was unmatched. Ned is survived by his children, Sandra Miller, Lorri (Howard) Fleck, and Gary Wade; grandchildren, Shelly (Travis) Ryun and Brandon (Cinda) Fleck; great-grandchildren, Andrew, Alora, Alison, and Landyn. He was preceded in death by his wife; parents; sister, Margaret Inglehart; and one infant brother, Leslie. To send flowers to the family of Ned Monroe Wade, please visit our Heartfelt Sympathies Store.